Mice Parade’s seventh album creates an interesting atmosphere throughout, but manages to sacrifice song craft in the process. With Mice Parade's seventh album, the band might consider a name change. To me, Mice Parade implies (pretty obviously) a string of small things one after the other. Mice Parade is a lot of things, but it is not small. Even clocking in at only 35 minutes, the album seems grandiose. Each song sounds intricately put together and painstakingly recorded. 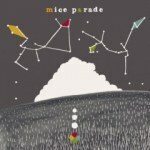 And Mice Parade has certainly cultivated an atmosphere with this album. The sound is heavy and brooding and occasionally raucous. Adam Pierce's ability with the guitar is once again on display here, as are the atypical drumbeats, and thick layers of instrumentation all over the place. The trouble with Mice Parade is that it relies too much on atmosphere and too often shirks song craft. And while it is a very good sounding record, this album doesn't quite hold together from song to song. "Sneaky Red" and "Tales of Las Negras" are the first two tracks, and provide the most clear cut songs on the record. They rely on distinct, interesting riffs and melodies. They have a recognizable song structure, and are the most memorable tracks on the record. "Tales of Las Negras" is a particularly impressive feat as Pierce (along with guest vocalist Laetitia Sadier of Stereolab) manages to best marry a solid song with the atmosphere of the album. The drums sound far away, but still chug along with enough presence to carry the song. The ambient guitar and keys serve as a nice counterpoint to the heavy sound of the drums and provide a solid plate to set Sadier's wispy vocals on. Later on in the record, "Double Dolphins on the Nickel" nearly succeeds at the same level. In this one, Pierce is helped with vocals from Mum's Kristin Anna Valtysdottir, and the soft, acoustic notes pulse over the drums as the song quietly builds. But the song also illustrates a fundamental question that comes up throughout the record. What is it building to? Most of the album spends too much time layering the songs instead of stopping to consider what the song will conclude as. There is just too much going on here, plain and simple. The use of so many instruments everywhere on the album makes it sound crowded. The lack of structure as many of the songs go on makes the album sound untethered. Mice Parade has crafted a solid sounding record, but also one that resists being memorable in favor of instrumentation that teeters on the brink of ambition, threatening to tip over full-on into conceit.